Benzac AC Gel (Benzoyl Peroxide) is a topical acne treatment. The active ingredient in this gel is a type of keratolytic, and its mode of action involves helping to break down a type of protein (called keratin). 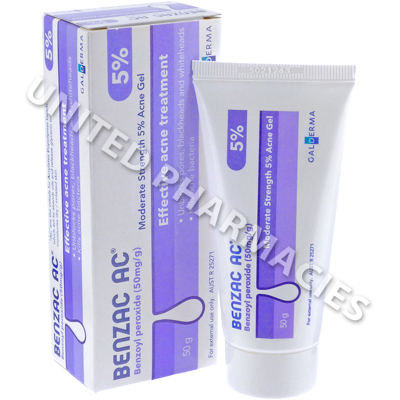 Benzac AC Gel (Benzoyl Peroxide) is a topical acne treatment. The active ingredient in this gel is a type of keratolytic, and its mode of action involves helping to break down a type of protein (called keratin). Application of this gel to the skin allows the top layer of skin to shed, which in turn helps to get rid of whiteheads and blackheads. In addition to this, it also helps to destroy the bacteria on the skin that can cause acne. Benzac AC Gel (Benzoyl Peroxide) is applied topically to the area of skin affected by acne. Your doctor will give you specific instructions with regard to proper application of this product. It is important that you continue using this gel for the entire period of time that your doctor tells you to use it for. Tell your doctor if any side effects become serious. Seek medical attention immediately if any severe reactions occur. Do not apply any skin products which may trigger irritation, such as harsh skin cleansers, hair removal products, alcohol or any other similar products. Also, avoid using other medicated skin products unless told to do so by your doctor. Do not allow this medicine to get into the eyes, mouth, ears or any other sensitive part of the body, and avoid applying it to broken, irritated or damaged skin. Always use Benzac AC Gel (Benzoyl Peroxide) as you have been prescribed by your doctor. Never self-medicate or change your dosage without first consulting your doctor. The correct dosage can vary depending on your health, medical history, and the severity of the condition being treated.